HomeBiz-Tips Ezine: April 15, 2006 Issue with 2 gifts! Can free blogging bring in profits and an Internet income? The one word answer to that question is: YES! 1. Go to click bank and and select 4-5 products in a niche that you are interested in and get the affiliate code. Try for 50-60 percent commission products. 2. Next download the free program Goodkeywords and find out the keywords used by people who wants to locate the information these 4-5 products contains. Narrow down to 4-5 keywords that are searched more than 10K times a month. 3. Now go to MSN and search on your narrowed down keywords. Choose the one keyword where you will find least competition. Also, note the affiliate product from clickbank that closely resembles to this. 4. Go to www.blogger.com and open your free account with your selected keyword as the blog name. Remember to put this keyword once in the title and three times in the copy. 5. Once you have a fully functional blog, it's time to put your affiliate Ads and the Google Adsense code on your blog. May be you can read on Google Adsense Tips too for cutting edge success. That's it. You are on. P.S: If you would like a professional way of learning the above techniques with screen shots, minute details and SEO tricks, please read Blogging To The Bank manual. You will come out with a 'doable' idea on blogs. "How A Computer Dummy Became A Super Affiliate Overnight Earning $914.46 Per Day And Grabbing A Stack Of Top 10 Search Engine Positions!! One of the fine things about Blog Announcer Pro, that I noticed is, it is NOT some spam machine blaster that will fire off submissions to every directory out there. In fact, it is an incredible bit of software! Once you set up your profile in the software, it will begin submitting your blog easily by visiting each of the Blog & RSS directories. No! You do not get banned by these directories because Blog Announcer Pro "views" each site exactly the way you were browsing them yourself unlike some Autoping Software in the market. And if you use of any of these Autoping Software's -- these directories will only be too happy to ban you! And it comes preloaded with the best directories and you get lifetime updates. Now, most online marketers spend days and days figuring out how to attract the powerful search engines to your site and get your pages indexed. But the solution evades and you sit and seethe knowing the brutal truth that traffic equals income and search engines brings in targeted traffic for free! So If you are a blog owner, affiliate marketer or just a website owner screaming for more traffic then you better unplug the phone, grab a coffee and get ready to be amazed. ... then you NEED to look no further. 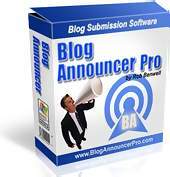 Just grab a copy Blog Announcer Pro right now! Google AdSense - is fast becoming the preferred way for people to earn an income online. Forget eBay and multiple affiliate programs. Whether you are a work-at-home mom trying to make a little extra cash or an Internet entrepreneur with hundreds of monetized websites, AdSense is truly the easiest way to earn money. The self-proclaimed AdSense gurus and experts are sharing this insider knowledge, for a fee. When choosing the ad heading colors, match them to the *exact* color of your page headings. Use the exact same ad background shade as your page background. Use the exact same ad text font and color as the text on your pages. You can see an example of this color-matching on my Search Engine Advice Blog - notice the 4 link ad unit at the top and the skyscraper text ad unit on the left hand side under the heading Ads by Google as you scroll down the page? The link and text colors are identical to the color palette used throughout the rest of the page. 4) Research competitive keywords using a keyword research tool such as Keyword Elite or grab a list of the most popular keywords from various sources and use them in your web site pages where relevant. This article - is a good source of frequently searched keywords. Targeting popular keywords should trigger AdSense ads on your pages that utilize those keywords. The more popular the keyword or phrase, the higher AdWords advertisers are generally willing to pay-per-click for it so the higher your commission on those clicks. 5) Incorporate the AdSense code into your page so that the ads look like a regular part of your site. You can see an example on this Internet Dating Stories site - where link ads are incorporated within the regular left hand navigation of the site under the heading "Sponsor Links". 6) Use Google's new 4 and 5 link ad units wherever possible. They seem to have a much higher Click-Through-Rate (CTR) than regular ad styles. You can view all the AdSense ad formats at this page on Google. 7) Place arrows or images next to your ads to draw attention to them. You can see two different versions on this search engine article library page - at the top (where a pointing hand directs your eye to the ad) and the bottom where 3 images draw your attention to each of the three AdSense ads. 1 horizontal 4 link ad unit towards the top of the page under the first paragraph. 1 vertical skyscraper text ad unit about halfway down the left hand side under "Sponsor Links". 1 vertical skyscraper image ad unit down the left hand side under "Sponsor Links". 1 horizontal text banner unit at the bottom of the page with images above each ad to draw attention to them. 9) Tailor your page content to a particular niche or focus. Page content that is tailored towards a specific theme is more likely to trigger AdWords ads that closely match the content and are therefore more likely to interest your visitors and inspire them to click. Don't create pages merely for the sake of placing AdSense ads. Visitors (and search engines) can see through this ruse in an instant. Kalena Jordan is one of the first SEO experts in Australia, who is well known and respected in the industry, particularly in the U.S. As well as running her own SEO business, Kalena manages Search Engine College - an online training institution offering instructor-led short courses and downloadable self-study courses in SEO and SEO Mkg subjects. 1. Blogging To The Bank -: This is a fluff-free and hype-free, ebook that I have read in a long time. The best thing about it is that, the author Rob Benwell, uses a real life example of some of his blogs. This ebook reveals detailed and proven money making techniques with screenshots that are simple and easy to follow. It contains the keys to making your blog a success, Blogger or Wordpress -- which is the best, how to attract search engine traffic for free, the most successful blogger template to use and the best area to place your Adsense ads for greater profit. 2. PopUp Bonanza -: It's a proven fact that popups improves your subscription ratio and conversion ratio. Some estimates a hike of more than 500 percent. But what do you do with popup blockers around. 1. Bookmark Master - : For those of you that use IE or one of its clones, and have caught your self wondering, "Now where did I bookmark that site to my favorites?" more than once, this tool is for you. With Bookmark Master You can get very detailed info about your favorite link on Name, URL, Folder Path, Validity, Accessed Time, Connect Succeeded Time, Created Time, Connect Info, and Webpage Title. 2. Sonic Contact -: Sonic Contact is a open source, web based contact form. This form adds anti-spam, flexibility and security features that separate it from other contact forms. Features include: block spammers by IP Address, block Spammers by Email Address and the "Gotcha" style security helps ensure a real person fills out the form. A very nice free script for your site. Well. That sums up the first fortnight of April-2006. Do not Forget To Rate 'HomeBiz-Tips'. Your valuable vote helps us to improve this E-Mag as well as allow us to keep it Ad-Free.